The competition for who would be named Payback Super Stallion at the 2009 SHN was determined Saturday night with a huge win for VMA Khahpur Khopi+/ in the Supreme Champion SHIH Class. Sired by the Khemosabi son Kharbon Khopi, this is his second time winning the Supreme title. He also won it in 2007 as a 3 year-old. With 11 Payback Stallions competing this year, it was anyone’s guess who would triumph. 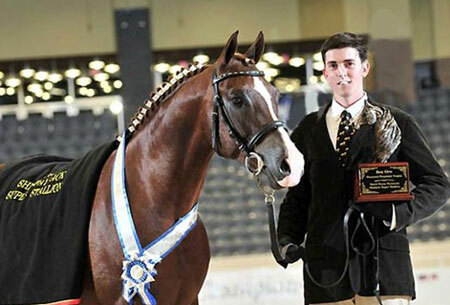 Showgun PGN was in the lead from the first day after winning the Open Working Hunter. OKW Entrigue+++//, last year’s Super Stallion, was only in two classes. AM Good Oldboy+ was entered in several classes, but decided by mid-week he was not fond of showing in hand (“I’m a WORKING horse, NOT a poodle!”). The perpetual trophy and embroidered dress sheet were donated by The Dunlap Family, in memory of their Arabian stallion Bey Oro, who passed away in 2008. Our thanks to them for the beautiful awards!